November 24th 2017 – Hardly ever do we get EPIC weather conditions like this Thanks Giving day weekend to let us get after all the fish from the reef to the deep sea blue waters. The headliner this weekend would have to be the Wahoo. Its not a common thing to get consistent bite on wahoo, but this weekend certainly made it seem like we do. 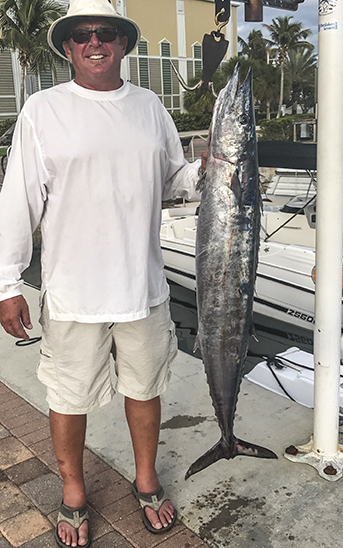 Not only were the wahoo hard at it showing our anglers a blast on the waters here off of Key West but we also have reports of dolphin, sailfish and blackfin tunas. This wahoo was part of the Key West offshore slam caught while fishing with Capt. Rob Harris on the Gotta Go II. Reports are coming in from all of the deep sea fishing boats that we work with including our very own Yellowfin 36 center console the Too Intense with Capt. John AKA Merlin and the Gotta Go II with Capt. Rob AKA Scorpion. The wahoo seem to be concentrated most heavy just to the South West of Key West. There is an area of difference in depth that we as Key West fishing guides fish allot and a couple of wrecks that hold fish making for a nice gathering spot for different species of fish at different times of the year. This time of the year its tuna and wahoo in this area. Check out the Key West Fishing Seasons Calendar for a complete year in our fishing. It all depends on how you like to fish as to how to go about targeting these amazingly fast fish. Many fishing guides like to hedge their bets this time of the year trolling ballyhoo skipping along on the surface and darker colored lipped plugs pulling a little deeper for the speedsters. I think the main trend among the trolling captains is wire. This time of the year most everyone is using a trace of wire to fend off the incredible abundance of teeth out there among all the species of fish that might be provoked to strike any trolled bait. Blackfin Tuna caught with Capt. Rob Harris on board the Gotta Go II. Part of a Key West offshore slam joined by a dolphin and the above mentioned wahoo. speedos take a few minutes to locate and chum up to the boat to be dip netted right from the side of the boat or use a sabiki to tease these tasty little wahoo snacks into eating. Only a few baits are needed to take advantage of a day of a strong wahoo bite. An interesting observation this holiday weekend is the number of spear fishermen that are taking advantage of the numbers of wahoo gathering in this area. The latest craze in spear fishing is shooting a wahoo as a bragging rights trophy. I wont get into the skill needed to pursue this endeavor, its not for the novice I assure you. 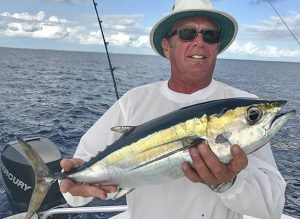 Besides the excellent wahoo bite there have been a good number of dolphin reported with a mix of sailfish and blackfin tunas. Reports are also indicating that the kingfish are also showing up in good numbers and size. Im usually not a huge fan of deep sea fishing in November but this month, this year has been really good. All in all I think its anyones good bet to get offshore with one of Key Wests deep sea fishing boats to try their luck at our amazing fishery. We have 4, 6 and 8 hour fishing charters available for you to chose from for up to 6 persons per boat with rates starting at 750.00 for the 4 hour day. Here are some really good trolling lures for Wahoo that we use as professionals.